It’s a given that good corporate governance practices need to be fully integrated into the culture, strategy and operations of an organisation. And in the Middle East region significant progress has been achieved over the past decade in establishing governance frameworks, particularly at listed companies in markets where corporate governance codes apply on a comply or explain basis. But numerous challenges lie ahead, such as the ability of listed companies to attract more institutional capital to the region’s markets, especially amid an increased focus on the effectiveness of boards following the opening of Gulf markets to foreign investment. The quality of disclosure practices is believed to be a key concern for foreign investors, as outlined in the recent Corporate Governance for Competitiveness in the Middle East and Africa report by UAE-based conglomerate Crescent Enterprises and the Pearl Initiative, the not-for-profit institution working across the Gulf region of the Middle East to influence and improve corporate accountability and transparency. According to the report, improving the governance of businesses, particularly family-owned firms that comprise the majority of non-oil economy in the Middle East, is a top concern for the region with assets estimated to be worth trillions of dollars expected to be passed on from one generation to the next in the region within the next five to 10 years. The report also provides a number of recommendations concerning the state-owned (SOEs) sector, noting that SOEs are generally not subject to competition law and other relevant legislation, or the corporate governance guidelines that apply to private firms. Strengthening the pipeline of female talent through to senior levels is an area that has seen significant strides made over recent years in the region but there is still much work to be done, with the number of women advancing to senior executive and board levels within organisations in the GCC remaining low. According to research by the Pearl Initiative on Women’s Careers in the GCC: The CEO Agenda, fewer women enter the workforce in the GCC and fewer make it to senior positions than in almost any developed region, because too many women opt out of their career before they get that far. Improving gender diversity will lead to more competitive and well-governed organisations across the Gulf region. 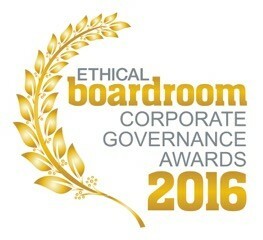 Ethical Boardroom is proud to announce the winners of “Best Corporate Governance” in their respective industry sectors across the Middle East for 2016. The awards recognise the outstanding leadership from boards of public companies who have raised the bar to ensure that strong corporate governance plays an essential part in protecting and enhancing long-term value for all stakeholders. Our awards program is a vital part of our continuing mission to elevate corporate governance standards globally. For those who have made it to the top of the mountain for 2016, we salute you for leading the way. Please note that the winners for the Americas region will be announced in the Summer 2016 edition.